Vincent is gay. He's also a preacher's son (the kind that preaches that all gay people go to hell). And since an incident when he was little, his mother has made sure there's been "nothing pink" in his life. Now he's a teenager, and he's been hiding being gay for a long time. Suspicions form, and ultimately, Vincent's secret is discovered. What is he going to do? How can his parents still love him, if they hate such a significant part of who he is? How is Vincent ever going to reconcile God, his family, and being Gay? 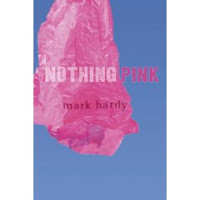 Add your review of "Nothing Pink" in comments! I've never heard of this, but it does sound good. I'd love to read it at some point. I've never really read a book that deals with sexuality and religion, though I know of some and have been meaning too...it's very interesting to me since I'm Catholic, yet I definitely don't believe that it's wrong to be gay. it's just who you are. gay. straight. doesn't matter. if you click on the "faith/religion" tag, you'll see all three YA books that deal with being gay and being religious that I know about. Lee: Thanks so much! I'll check it out. "Vincent has always known that he is gay, and he suspects that his parents have known since he was very young. This unspoken knowledge is a big problem, as his father is a Baptist minister. A series of events force the family to bring the issue to light, and Vincent questions both his religious views and his place in his family. The characters seem shallowly drawn, and the time setting is unclear and inconsistent. The conflict between sexuality and faith was explored in a far more satisfying fashion in Alex Sanchez's "The God Box", which is highly recommended over this title." I vastly, by miles, preferred "The God Box" and that is the title that I would recommend to readers seeking a book on the this topic.